We went to the annual hunter’s lunch in the village today. We left at 12:00 and got back home at 5:30. It’s a 3 minute drive…..
To start we had the usual apero. Today it was Sangria. 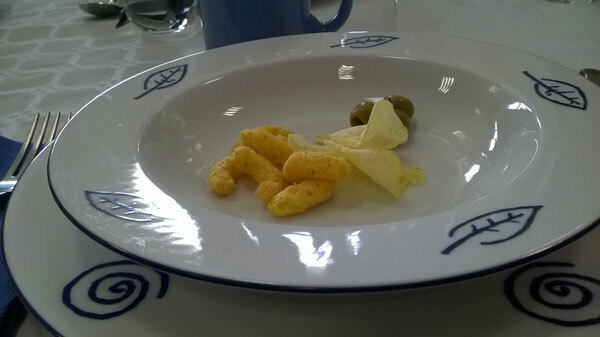 The nibbles were actually served in big bowls but I put a few in my soup bowl for the photo. We bring our own plates, glasses, tableware, etc. for these lunches. The first course was soup. 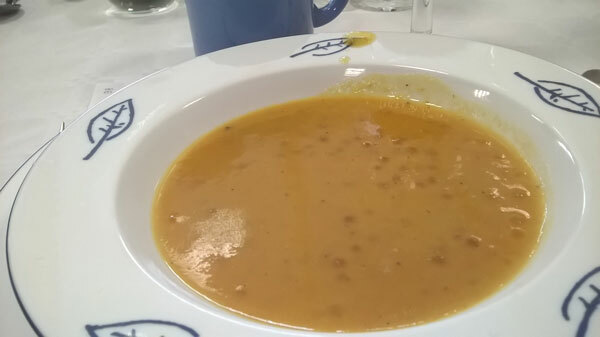 It was a vegetable soup of some sort with ‘Japanese Pearls’ or tapioca. 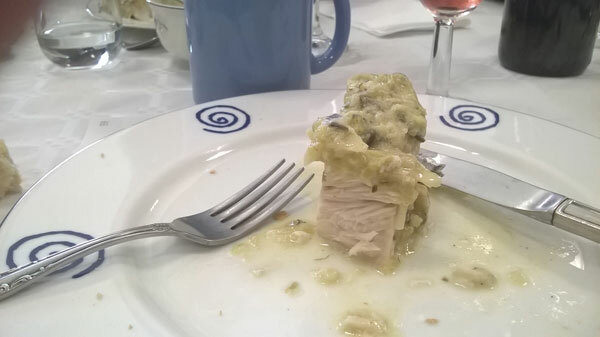 The second course was fish – perch with a leek sauce. I almost forgot to take the photo….. There was both red and rose wine served, and bread, of course. 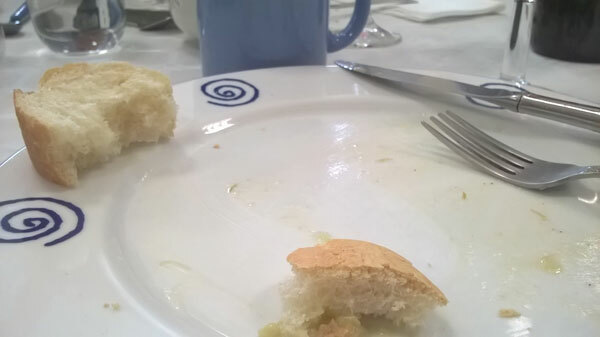 One uses the bread to clean the plate between courses. 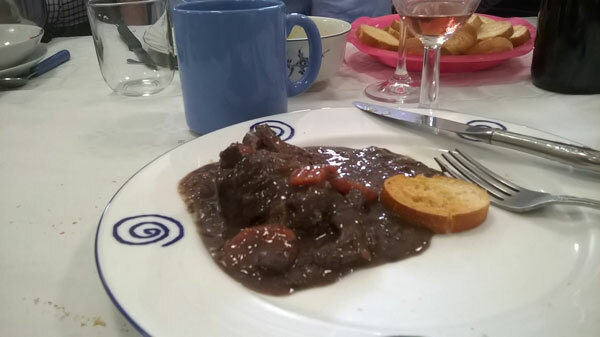 Next was Civet de chevreuil, or Venison Stew. 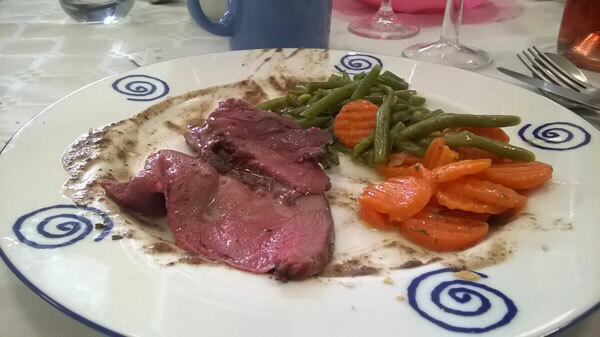 This was followed by Gigot de chevreuil or roast leg of venison, with vegetables. 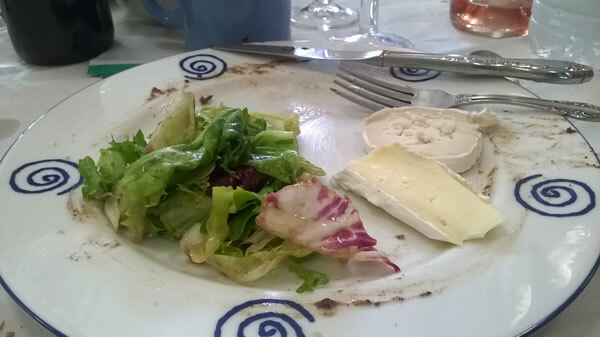 Then, of course, was the salad and cheese…. After we cleaned our plates again, of course. 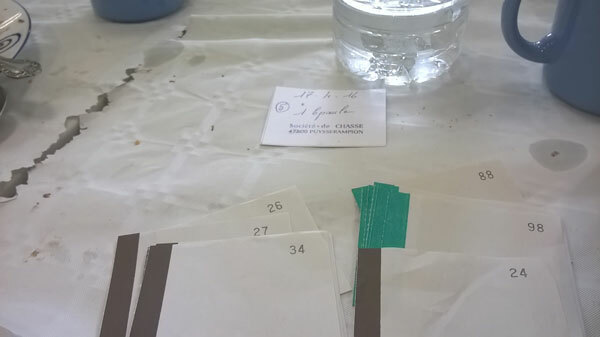 Then there was a wee pause while we had the lotto – or drawing, that is part of most events in rural France. Those are the tickets I bought and at the top you can see my winning coupon. I think there were about 15 prizes in all. 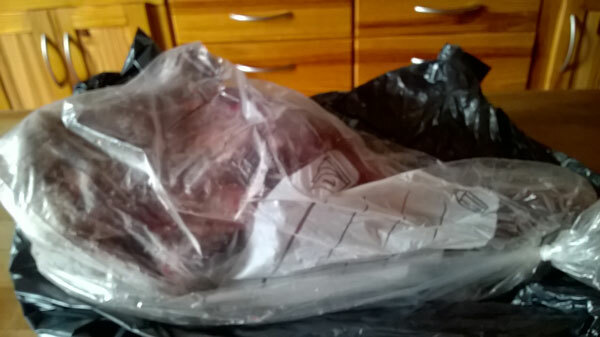 A shoulder of venison, to be exact…. frozen, thankfully.. I was told it would feed 12. I could barely get it in the freezer. I’m sure it won’t fit in the oven. I think mon mari will have to cut off the long bone with his table saw. 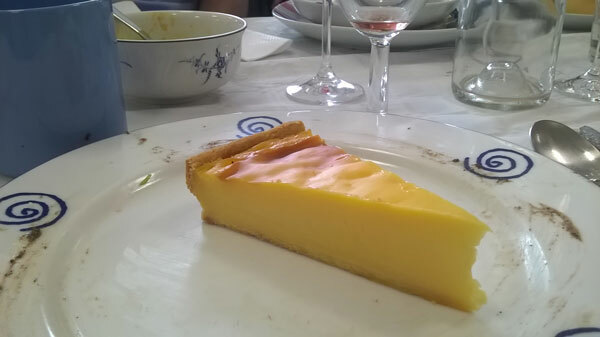 After that excitement we had dessert – a simple custard tart. 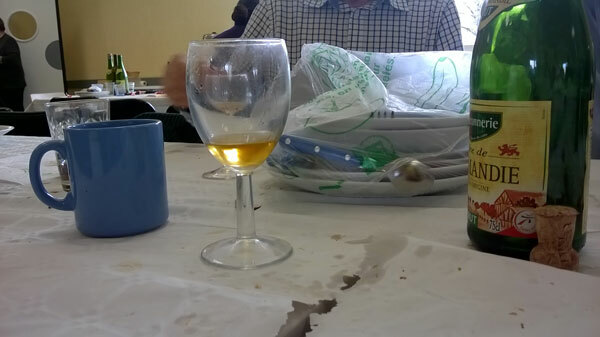 Well, we had a rather big lunch….. a simple dessert was in order. Along with dessert we had bottles of sparkling cider. We finished with coffee, chocolates and Armagnac. Mon mari is having a nap. I believe I’ll join him…..
Food and friends; how lovely. Wow what a lot of food – delicious looking too. And how cheap is that? We recently went out to a fancy restaurant to celebrate birthdays. Hubby had pan seared halibut, roast potatoes, steamed veggies. I had a dungeness crab, blue crab risotto, with steamed veggies. Plus 1/2 a litre of wine for us both. No appetizers or dessert. The bill was $135.00 Canadian! A once in a while treat that was spectacular….but I must say, your lunch looks very impressive at an incredibly cheaper cost. No wonder you’re tired! I bet it was the armagnac (although the sangria would have started giving wine legs). I hope you didn’t have to do anything after lunch – that looks fabulous – I especially like the look of the fish. And the venison stew. And the salad. And the cheese. And the…. Wow!! You won a shoulder of venison! Do you feel a bit like the Flintstones now? Bargain lunch, love that dessert ! Sounds like a fabulous feast, and a necessary nap! Outstanding! I would have felt right at home. Thanks for sharing. Phoenicia, it was fun – but we sat in one spot for over 5 hours! Elizabeth, I did rather feel like Wilma toting that leg back to the house lol The price is amazing.,.. we’re so spoiled here. Kate, dessert was good – I had to eat ti all, too. We bring the dishes so they have to be clean. Zoomie, we barely moved the rest of the day. 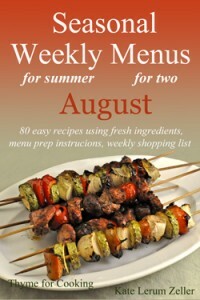 Chef mimi – it was, but glad it’s not every week! Susan, we used to have ‘village’ meals when I was a child in the midwest – it’s nice that they still do it here.